This Ginger Turmeric Chicken is one of my family’s favorite summer meals. The ginger turmeric marinade creates grilled chicken that is juicy and intensely flavorful. The recipe is also perfect for summer cookouts since it can be easily doubled (or tripled!) to feed a crowd. This versatile ginger turmeric marinade is dairy-free, gluten-free and Whole30 compliant! When grilling, I typically use boneless, skinless chicken thighs instead of chicken breasts. Thighs stay juicy and showcase the flavors of this ginger turmeric marinade well. However, chicken breasts, shrimp, and even tofu are delicious when prepared with this marinade. Just be sure to adjust the grilling time accordingly! Ginger turmeric chicken that is gluten-free and dairy-free and loaded with incredible flavor! Note: preparation time includes overnight marination. *Note: Did you know that 80% of the antibiotics sold in the United States are for livestock? This is why I choose to purchase chicken raised without antibiotics. 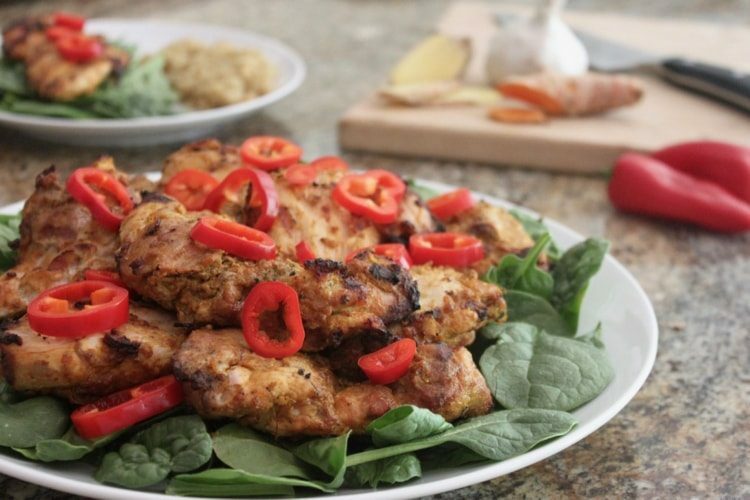 For a simple summer meal, I typically serve this grilled chicken on a bed of organic baby spinach along with a side of cauliflower rice or quinoa. The grilled ginger turmeric chicken is also delicious when served with a creamy cilantro lime sauce or dairy-free cilantro lime crema. This recipe was originally published on June 28, 2017. The recipe has since been updated with refreshed photos and enhanced recipe instructions. ohh I love that marinade – so full of flavor! I made this for dinner last night using bone in chicken thighs! It was super yummy, and will go into my meal prep marinade mix!!! Thanks! Tessa – I am so glad you enjoyed it! The ginger + turmeric combo is definitely one of my favorites! And I love that you used bone-in chicken thighs… they add sooo much flavor (not to mention all the goodness from the bones!). What a great way to get more turmeric in! I’m pretty much grilling every meal now with the warmer weather, so I can’t wait to try this out, it looks packed with flavor! Thanks Kari! We grill frequently too in the summer! I usually double this turmeric chicken recipe as the leftovers are delicious on greens for quick salad meal in the week! I hope you enjoy the recipe as much as we do! I will be putting this in my Whole30 recipe file for sure. I love adding a little spice to my meals – especially when doing a Whole30. I hope you like it Katie! 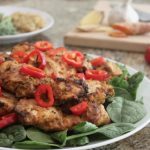 This chicken was a staple during my recent Whole30! But we eat it all the time now because it is an easy, healthy meal everyone likes! I agree that thighs are best! Your marinade looks so yummy! Cumin, ginger, turmeric… my favorite flavors! This looks awesome! Thanks Lindsey! Ginger, turmeric and cumin are definitely staples in my kitchen! Thank you so much! I hope you enjoy it as much as we do! Oh yum yum, this marinade looks fabulous and I love how versatile it is. Perfect for meal prepping to use through the week! Thank you Monique! Meal prep is a huge weeknight dinner saver (and weekday lunch too)! I’m always on the lookout for great grilling recipes to feed a crowd. I’m pinning this one to save! Thanks Cathy! I hope you enjoy this yummy grilled chicken as much as we do! I love using chicken thighs like this bc they pack so much flavor with that little bit of extra fat. I try to incorporate turmeric whenever I can so this is a must try! Love the spice combo! I love ginger and turmeric together, and I’m excited to fire up the grill for this. I am so excited to add this to my BBQ repertoire!! Always looking for different marinades to try. this one looks awesome! I love easy and nutritious marinades like this! It sounds delicious! I love that you use chicken thighs here. I feel like they are so underutilized, but they are really great pieces of meat when cooked right. I can’t wait to make these tonight. Thanks Amanda! Grilled chicken thighs are definitely my favorite… they have so much flavor and are much more forgiving to grill! That marinade sounds wonderful! I love ginger, but tend to fall into ruts in the way I use it – this is a bit different for me. Wow, I love the ginger turmeric marinade. So flavorful! Using the fresh turmeric adds amazing flavor. Thank you Eileen! The fresh turmeric does add amazing flavor… though I have used dried turmeric in a pinch and it is also delicious! You’re speaking my language with this marinade. Ginger and turmeric are awesome flavors for grilled chicken! I absolutely love ginger and turmeric blend. It’s one of my favorite spice combo EVER. This chicken must taste heavenly good. I can’t wait to make this for my family. 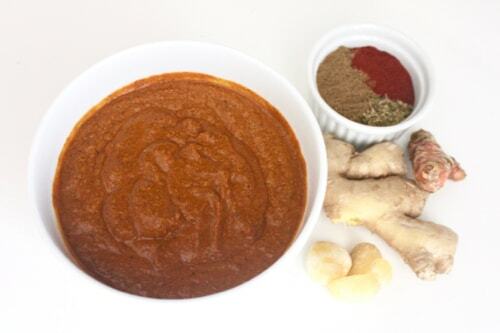 Natalie – this is, hands down, my favorite marinade! The chicken is so flavorful, everyone in our family just adores it! I always make extra so we can enjoy it during the week on salads for a simple meal. I hope you enjoy it too! Love this for a meal prep idea! We eat a lot of leftovers since everyone is always home at different times. The idea of grilling up chicken that will keep its flavor for a couple meals is definitely something we look for – especially the tumeric and ginger combo! Definitely going to need to try this recipe! Looks like a great way to mix up making large batches of chicken breast for weekly meal prep. Thanks Kelli! 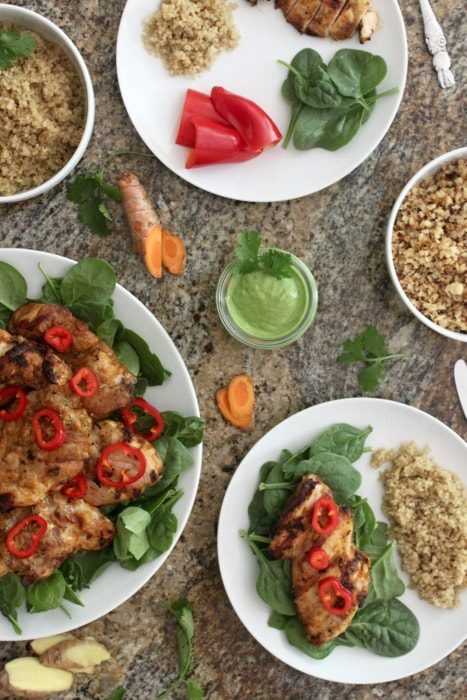 Yes, this turmeric grilled chicken is delicious when reheated… so it would be perfect for weekly meal prep! Yummy, I’ve been going to a ginger and turmeric kick lately. I will have to make this for dinner soon. I love that you use ginger and turmeric…sounds delicious! Thanks Sandi! This is a very flavorful marinade that is definitely a family favorite! Love seeing creative ways to use turmeric! I love turmeric! This is a great way to use it! Thanks Deanna – it is definitely one of our favorite marinades! I use it on chicken, shrimp and even tofu! Oh yum! I love the ginger and turmeric combo too! Sounds like a delicious dish! It is definitely worth trying – very flavorful! LMK if you try it!!! Love that ginger and turmeric are so on trend right now! I hope they don’t go anywhere! I couldn’t agree more Kelly – both are delicious and loaded with flavor!